Waste Management news about the company’s plan to acquire Advanced Disposal (NYSE:ADSW) has WM stock up on Monday. 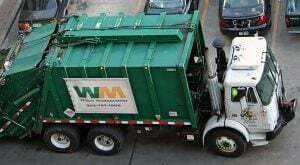 Waste Management (NYSE:WM) is planning to acquire Advanced Disposal for a total of $3.00 billion. This will have it paying $33.15 per share in cash for ADSW stock. The value of the deal reaches $4.90 billion when taking into account for $1.90 billion of Advanced Disposal’s net debt. The Waste Management news about its offer for Advanced Disposal is also good news for ADSW stock as well. The offer of $33.15 per share for the stock represents a roughly 22% premium over the stock’s closing price as of April 12. Waste Management notes that it is expecting to see several benefits from its acquisition of Advanced Disposal. This includes the company being able to expand its footprint through the deal. It is also looking for the acquisition to be immediately accretive to its earnings and cash flow. The Waste Management news has the company expecting synergies to come from its acquisition of Advanced Disposal. Among these are $100 million in projected annual cost and capital expenditure synergies. Waste Management already has the unanimous approval from both companies’ Board of Directors to move forward with the deal. However, it will still need approval from ADSW shareholders and regulators before it can close. If all goes well, the two companies are expecting the deal to close in the first quarter of 2020. WM stock was up 2% and ADSW stock was up 18% as of Monday afternoon. Article printed from InvestorPlace Media, https://investorplace.com/2019/04/waste-management-news-boosts-wm-stock/.